I'm not sure how to even begin this review. When I first picked up Miss Peregrine's Home for Peculiar Children, I thought it was going to be some creepy horror novel, and that usually isn't my style. But this novel is much more than that. Miss Peregrine's Home for Peculiar Children is quite the genre-bender! Elements of fantasy come together with mystery and suspense, all wrapped up in a historical setting with a touch of horror here and there. Unique barely even begins to describe this novel! Normally, I don't like male narrators, because I feel like I can't relate to them as well as a female narrator. But I really connected well with Jacob, I got really emotionally invested in the story and the characters. I don't want to give away too much about the rest of the peculiar children, but they were so cool to read about! Like nothing else you could possibly read about in any other book! The things that made this novel stand far apart from everything else I've read, were the fantastical black and white old pictures scattered throughout the novel. They bring the book to a whole new sensory level, giving you a solid image to visualize in your head along with the vivid descriptions that Ransom Riggs gives us of the characters. They add a major creepy factor, but that only enhances the ambiance of the thing as a whole. 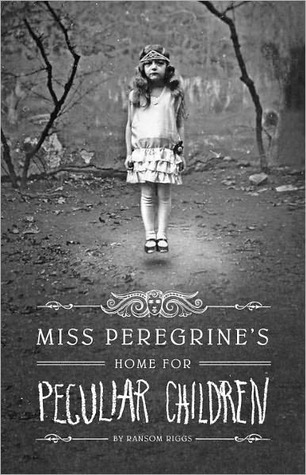 Overall, I love love LOVED Miss Peregrines's Home for Peculiar Children! Put it on your to-be-read piles now, you'll be so glad you did! I give this novel 5 out of 5 stars. If you're still not convinced you should read Miss Peregrine's Home for Peculiar Children, watch this TOTALLY EPIC BOOK TRAILER!! Made my Ransom Riggs himself! This is an awesome review. I've been trying to decide whether or not to read this book, but I think I probably will now. I've watched that trailer way too many times to be healthy ;) It's so good though. Really enjoyed reading your review. I still haven't had a chance to pick this book up myself yet but I obviously need to. I'm glad you enjoyed it! This is top of my summer holiday reading pile - can't wait to get stuck into it. I agree this one was unique and blended genres seamlessly! I didn't really get the horror feel in it but the suspense and mystery was there. Loved the story-line and characters because they were so unlike any others i've read :) Great review! @Linda, thanks! I definitely recommend you read it! @Kaity, the trailer is absolutely amazing. When I found out Ransom made it himself, I freaked out. @Katie, push it up to the top of your pile! @Shortskie, it's super creepy, but in the best way possible. Great review! My sister recommended this book and I've been contemplating it, but this trailer sealed the deal! This seems to have been THE book around the blogosphere lately, if you know what I mean. I can't wait to pick up a copy for myself. I've yet to read a negative review on it!